The latest Roger Moore James Bond movie, The Spy Who Loved Me, is easily the big summer movie of the year, and Airport 77 is a typical Hollywood blockbuster of the year. We're in the midst of disaster movie mania, Exorcist rip-offs and car-chase movies like Smokey and the Bandit. In the animal rampage movie stakes, we’re in between Jaws and Jaws 2, leaving the path clear for Tentacles to beat even Piranha into the sea. I can't remember what else was in the (three-screen) multiplex that week, or what was on in the other two cinemas in my local town. But movies shown on TV were at least five years old, so I go to the cinema weekly to see something new. Most cinemas are still showing double-bills - two movies for the price of one ticket, and there are continuous performances - I can watch the whole programme twice over if I want. So, once I see this poster, hear a scary radio ad, and see a clip on TV, I'm already suckered in by this double bill. 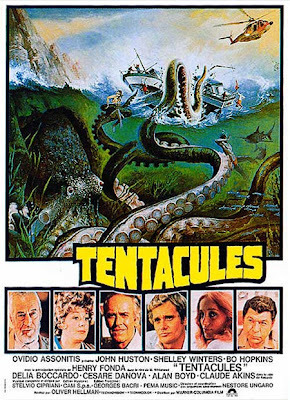 The cast on the poster for Tentacles look very familiar - if rather old. I’d seen Terence Hill before in Watch Out We’re Mad, which was fun. That week, this was the best of the bunch. 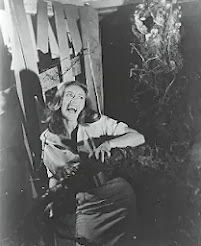 Hollywood movie budgets at the time were very low, often producing movies that looked like they were shot for TV. 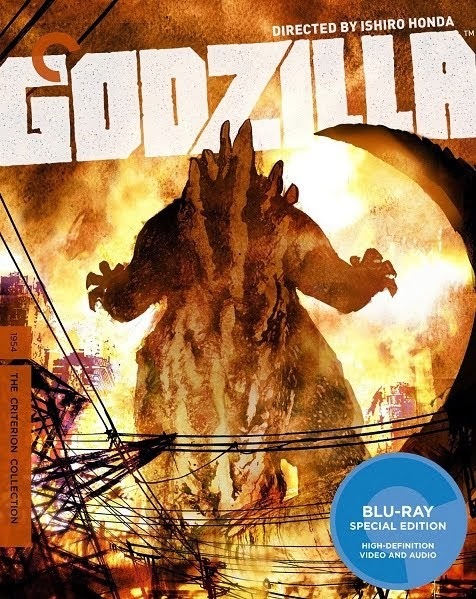 There weren't even any Japanese monster movies to be had - maybe in the US, but not in the UK. I think Shogun Assassin was one of the few movies that made it from Japan to Kingston-on-Thames. But we had lots of Italian films... The Antichrist, Suspiria, Zombie Flesh Eaters, and of course the Clint Eastwood 'spaghetti westerns'. But has Tentacles aged as well as any of its Italian friends? Thirty years later, my favourite scene then, is my favourite scene now. I remember being unimpressed with the finale - I was expecting something bloodier, like Jaws. 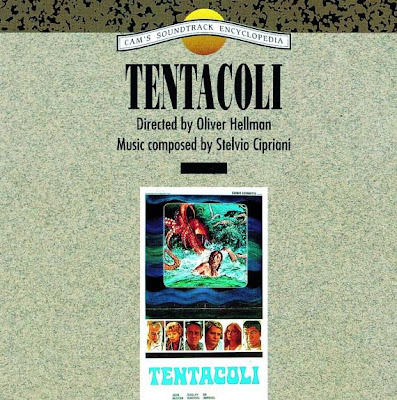 Tentacles' music had somehow imprinted on my brain, but little else from the film had such a lasting effect. 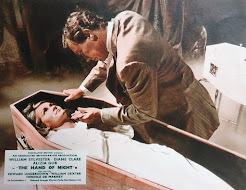 Shot in California, but largely an Italian production, this still manages to look like it was shot in Italy - with the usual grainy technovision, nutty Italian music, some obviously European bit-players lower down the cast, and of course the mis-matched overdubbing. It looks like Euro-horror, but its aimed at all the family. Mindbogglingly 'over-cast' with Henry Fonda and Shelley Winters, John Huston gets most of the worst lines, and plays the world's oldest investigative journalist. Bo Hopkins gets the worst scene, and Cesare Denova looks forward to his appearence in the following year's National Lampoon's Animal House. The youngest star is the beautiful Delia Boccardo, who looks spookily like many other of the Italian horror movie actresses of the time. The movie begins very cheaply, with a mysterious (off-screen) disappearence, using the same editing trick as the beach scene from Jaws, where people passing in front of the camera hide the rapid editing. Shelley Winters breathes a little life into her part, ad-libbing in character, but nothing she can do can stop the audience guffawing at John Huston's floor-length nightshirt. The mystery of the missing persons takes an ugly turn when a gory corpse pops up in the ocean (much like the disembodied-head shock in Jaws). But the body has had its bone marrow sucked out - this sounds more like the monsters of Island of Terror rather than the eating habits of octopi, however large. 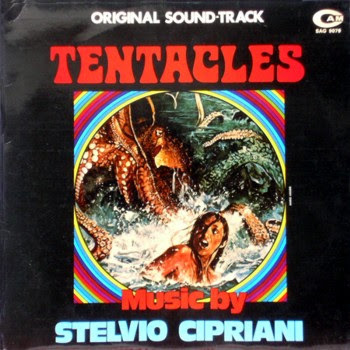 The composer Stelvio Cipriani suggests that the octopus is near, by using a short musical motif. But instead of John Williams' menacing bass strings, we get an annoying harpsichord riff, that suggests The Addams Family rather than menace. And it's very loud. And they use it a lot. On the good side, there are some surreal moments during the (well-photographed) underwater action. A forest of dead fish floating on end, at the bottom of the sea, isn't something you see every day. But the suspense is lacking and any action scenes are brief. Of course, we are well ahead of the entire cast, since we know perfectly well what's going on. Around halfway through, a small boat moored unwittingly near the monster's lair, gets attacked. This is where the film actually tips over into real horror. It's night, and the squirming mass of fake tentacles actually look convincing. The creature prolongs the agony as it plays with its food, and the victim screams her head off. 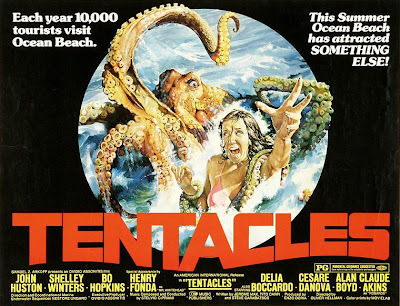 It's the only few minutes of Tentacles I'd recommend. All other enjoyment is purely unintentional. After a growing string of deaths at sea, the local people stupidly decide to have a regatta. Thirty boats, three stuntmen, a coastguard's helicopter, a fake octopus head, and not nearly enough cameras to catch all the action. With a limited amount of footage to actually string together the action centrepiece of the movie, they crank up the annoying music, crosscut between the chaos at sea, and the worst-ever observational comedian. Then they pad out the gaps with some Inexplicable freeze-frames. It's an almost meaningless montage - almost like they were cutting around whatever was actually happening. Well, at least they had the regatta idea before Jaws 2. 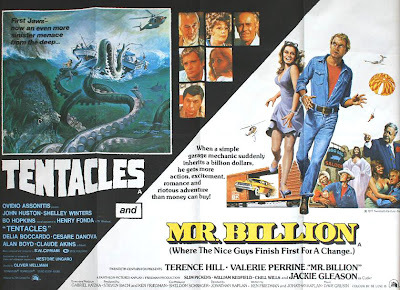 With the octopus causing widespread chaos, in the script anyway, oceanologist Bo Hopkins has to try and save the day. His knowledge of the sea knows no bounds, "All octopi have a sense of foresight". You what? Bo gets the short straw and has to give his killer whales a pep talk - this is a doozy of a speech, one of my first tastes of movie madness - a scene so mind-bogglingly bad, that I lose any sense that the film-makers are experts in their field. If you fancy this, it's on a DVD double-bill with the even worse Empire of the Ants, starring a pre-Dynasty Joan Collins. I don't have to make this stuff up. The Italian DVD (pictured above as Tentacoli) has no English audio on it, but has 5.1 stereo in Italian. The version runs the same as the US cut. Both DVDs present Tentacles in its original 2.35 letterbox aspect, anamorphically presented. A huge improvement on the previous VHS releases, which were severely cropped down to 1.33 - so you had even less idea of what the hell was going on! 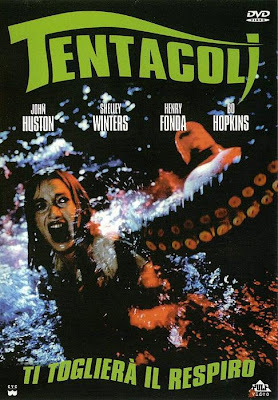 I saw Tentacles on a double bill along with Empire of the Ants at the long gone Midway Theater in Phila., Pa. at 12 years old. It was a weekly thing every summer. These kind of movies always stick with me. I too am a sucker for these films, especially when I was that age. These "Jaws copy cat" films were everywhere and I think we went to see them for the competition. I remember Shelley Winters being a big deal because she was in one of my favorite movies, The Poseidon Adventure. I now own the MGM/Midnight Movies Double Feature DVD release of this film (with Empire of the Ants)God, nostalgia has got it's grips on me, I must say. YOKAI TENGOKU - GHOST HERO (1990) a VCD bargain!